Lower Ten Mile River Salmonid Habitat Enhancement | Prunuske Chatham, Inc. In 2013, PCI began working with The Nature Conservancy (TNC) to plan and design projects to improve salmonid habitat value in the lower 1.7 miles of the South Fork Ten Mile River and 4.5 miles of the mainstem Ten Mile River in Mendocino County, California. The general premise compelling the Project is that off-channel rearing habitat and winter high-flow refugia is often severely limited in alluvial valleys where the channels have become simplified and disconnected from their floodplains, and that recovery of the salmon populations is dependent upon restoring this habitat and the processes that form and maintain it. Off-channel ponds, side channels, flooded wetlands, low elevation floodplains, and complex in-channel habitat associated with large wood are the habitat features that provide the low velocity environment that coho juveniles need to survive and thrive. 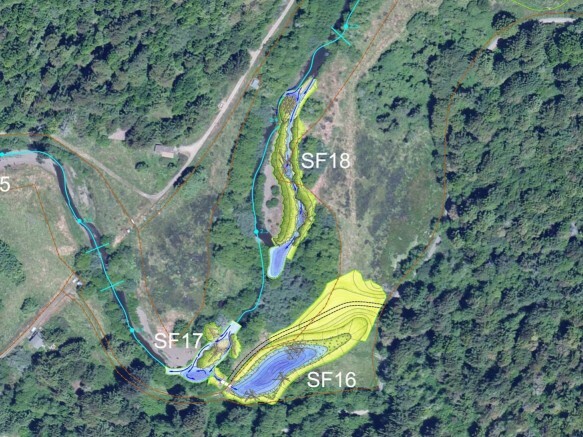 PCI developed a Habitat Enhancement Plan that included conceptual designs for twenty site-specific projects on the South Fork and twelve projects on the mainstem Ten Mile River that will provide this missing habitat. The Plan outlines the biological imperative, the channel dynamics, topographic opportunities, and habitat elements that provide the basis for the concept designs. PCI then prepared construction plans for nine of the twenty South Fork projects. The sites include an off-channel pond, side and overflow channels, and engineered log jams. The process-based designs PCI developed will serve as a demonstration of reach-wide restoration. PCI is currently working with TNC and regulatory agencies to prepare permits and CEQA documents, including all necessary background studies, for the first phase of implementation. The project requires a complex permit and CEQA strategy due to its size and the conversion of wetlands and agricultural lands in the coastal zone. With proposal preparation and technical review support from PCI, TNC was awarded $1.5 million in implementation funding from CDFW’s 2015/16 Fisheries Restoration Grant Program. PCI is assisting TNC with construction of four of the projects shown in the image above (SF 13-17) in 2018.